Girl Talk and Sisters Kin-nect are designed to empower women and girls to excel. Both are part of the city of St. Petersburg’s My Brother’s and Sister’s Keeper programming. ST. PETERSBURG – Nearly 200 district girls in grades 8-12 attended the second annual Just Girl Talk Conference in St. Petersburg last month. The conference was a collaborative effort between the city of St. Petersburg Urban Affairs Division, St. Petersburg College and the Pinellas County School District. The event was held at the St. Petersburg Coliseum. The Just Girl Talk Conference was designed to encourage girls’ brilliance and to cultivate their curiosity to achieve what might seem difficult and impossible. It also attempted to develop their leadership skills by creating a safe space for honest discussion of their needs from support systems in their community. The day included breakfast and lunch as well as breakout sessions titled: Pampering Your Soul, Level Up, Secure Your Bag, Planning, Mingle/Network. Ramona Smith, the 2018 Toastmasters World Champion of Public Speaking, was the keynote speaker. 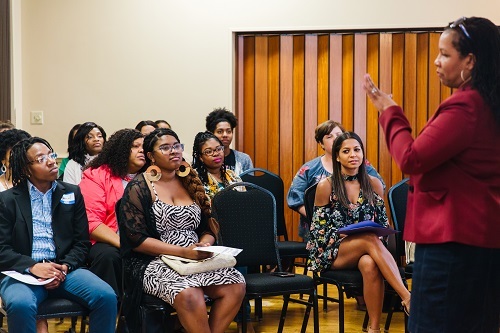 Attendees experienced culturally relevant workshops, panel discussions, self-care tips and empowerment circles led by local business owners, educators, community leaders and other influencers. The Girl Talk conference preceded the inaugural Sister’s Kin-nect program, which saw 75 young women from the St. Pete community gather to hear keynote speaker and 2018 Toastmasters World Champion of Public Speaking Ramona Smith and take part in workshops on topics ranging from organization and financial empowerment to mental health and professional networking. The goal was to provide women of all ages a chance to experience an evening of personal investment, intentional workshops and inspiring speakers. Both Just Girl Talk and Sister’s Kin-nect are components of St. Petersburg’s My Brother’s and Sister’s Keeper programming. For information about Sister’s Kin-nect and other MBSK programs in St. Pete, go to stpete.org/MBSK. Main photo of attendees at the Just Girl Talk Conference courtesy of the Pinellas County School District. In-story photo of attendees at Sister Kin-nect courtesy of the city of St. Petersburg. Girl Talk and Sisters Kin-nect are designed to empower women and girls to excel. Both are part of the city of St. Petersburg's My Brother's and Sister's Keeper programming.